Very responsive and a job well done! Thank you for the wonderful job that you did on stretching my carpet earlier this week. Your immediate response in finishing the job on the same day I called was remarkable. I very much appreciate the thoroughness of your work, and I am very happy not to have waves of carpet on the bedroom carpet anymore. Had a great experience with my carpet stretching today. I had many difficult wrinkles in my living room carpet and they all came out looking beautifully. Pablo showed up on time, was friendly, professional and went the extra mile for me. Would recommend! We had Pablo in to repair two small sections of carpet. He made the repairs quickly and described the process to assure me the repair would last. After he provided the initial quote for the work and started the repairs, Pablo noticed a third small section of carpet that needed repair. He took care of that section as well for no additional charge. The repairs are not noticeable, and the carpet looks great. I took out a wall and had a big long strip of the subfloor showing. 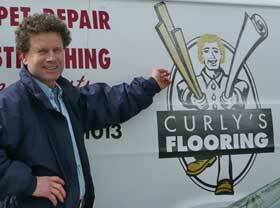 I googled carpet repair and Curly’s came up. A friend had a good experience with him so I gave him a try. I couldn’t be happier. The repair is pretty much invisible which I never thought would be possible. I would highly recommend Curly’s for your carpet repair. Pablo was very professional and he did a beautiful job of stretching our carpet. I would happily recommend him. Pablo was very professional and knowledgeable about what needed to be done to fix our carpet wrinkles. He was able to complete the work the same day and the rooms look amazing – like new carpet!! I would highly recommend Curly’s Carpet Repair to anyone that is in need of carpet stretching. As the custodian of First Presbyterian Church in Bellingham, I can attest to the the excellent work of Pablo and Jerry. They have joined separated seams and eliminated bubbles & ripples in our Sanctuary and Fellowship Hall.